Boy, time sure does fly when you're having fun (or just plain busy), doesn't it? Turns out that this here blog turned 4 a couple weeks ago, and I missed posting about it completely. Only when someone here at work asked me how long I've had LENNDEVOURS did I do a little thinking and realize that LENNDEVOURS turned 4 on March 15. I'm not the self-congratulatory kind, so let me just take a moment here to thank all of my readers, contributors and of course the New York wine community. Without each and every one of you (even the people in the wine world who can't see the big picture), this blog wouldn't be as successful as it is today. And to Mrs. LENNDEVOURS, the amazingly tolerant Nena, thank you for always supporting me in my wine-obsessed endeavors. I love you. As Lenn wrote last week, Wine Spectator just released scores for a list of 2006 Finger Lakes rieslings as tasted by James Molesworth. Many thanks to our friend over at Finger Lakes Weekend Wino, who has summarized these results in two posts here and here. The wines on the list represent some great wineries to be sure, and while I respectfully disagree with some of the relative comparisons between these tastings (the 2006 Ravines is, in my opinion, one of the best Finger Lakes wines I've ever tasted and deserves a higher score) it is encouraging to see that these wines are showing a great deal of consistency across the board. 2006 was a great vintage for rieslings, and many different producers are creating competitive wines that are true ambassadors for the region as a whole. Despite this success, I continue to be discouraged by the gentleman's B+ that Wine Spectator always seems to designate for the top crop of Finger Lakes wines. I am not implying that Finger Lakes rieslings deserve scores well into the 90s or even approaching the magical classic status of 95+, but it has been apparent to me over the last few years that no matter the quality of the group of rieslings tasted by Wine Spectator, the very best always hit a celing at 88-89. 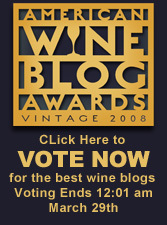 I received an email this morning that Richard Olsen-Harbich, winemaker at Raphael and LENNDEVOURS contributor has has received the for "Best Beverage Artisan of 2007" from Edible Communities and Edible East End Magazine. Rich is being recognized for making his significant contributions to the local foods movement for our region. Voting for the award took place online and ended in December, and you won't hear any arguments from LENNDEVOURS headquarters. Rich has been a member of the Long Island wine community for nearly 30 years and has authored all three local Federal American Viticultural Areas on Long Island" The North Fork of Long Island, The Hamptons, Long Island and Long Island. As you probably alrady know, Rich is also a founding member of the Long Island Merlot Alliance, Long Island’s first wine quality alliance formed in 2005 and dedicated to the advancement of quality merlot production on the East End. Rich also sits on the advisory board for wine and grape research at the Cornell University/Long Island Horticultural Research and Extension Center in Riverhead, N.Y. and has also served on the Board of Directors for the New York State Wine and Grape Foundation. So join me in congratulating Rich on this award. It's well deserved. You may have heard about this already, but April is New York Wine Month (warning, the website is awful). More than 300 fine restaurants and wine shops are featuring over 92 New York wines all month long. It seem as though the restaurants are spread out over the state pretty well, but it's not easy to be sure because of how they are organized (or not) on the website. This is a program that I'm obviously behind. It's important that the NY wine industry do a better job of marketing its wares to the local residents -- saturating them -- before worrying about other areas so much. If you can't sell your wine in your own back yard, it's just not going to work elsewhere. 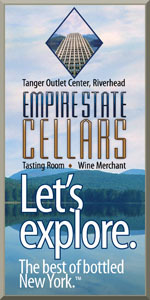 In honor of New York Wine Month, LENNDEVOURS will be focusing on NY wines for the month of April. 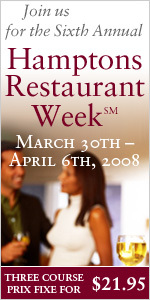 Anyway, check out the New York Wine Month website for details about the restaurants, shops and wineries involved. Drink local, people! Graphic courtesy of Uncork New York! Last year, Bedell Cellars added a new premium white wine to it's portfolio, named Gallery. I really enjoyed it and I actually just polished off my last bottle a few months ago. They didn't make much of it, so once my last bottle was no more, I wasn't able to get my hands on another bottle or two. 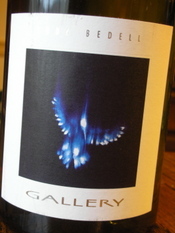 Luckily, Bedell has recently released the second edition of its flagship white with Bedell Cellars’ 2006 Gallery ($48). And even if I like this one a little less, it is far more successful that the two chardonnays I reviewed earlier this week, if still pricey and with a touch more oak than the 2005. It is a blend of chardonnay, viognier and sauvignon blanc and the nose is expressive with super-ripe peach and apricots up front with vanilla, faint toasted oak, baking spice and fresh flowers layered behind. Extremely flavorful and well textured, it fills the mouth with spiced apricot and peach pie flavors, lemon zest, hints of mango, vanilla and sweet oak. There is terrific balancing acidity here that should give this some longevity and a lingering, slightly minerally finish stands out. At $48, it's not a cheap wine to be sure, but these sorts of blends can be very successful with Long Island fruit. The success of Channing Daughters Winery is further evidence of that. 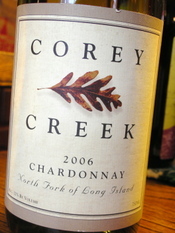 Yesterday, I wrote about Corey Creek's regular chardonnay from the 2006 vintage, a wine that I thought was this wine when tasted blind because of all the vanilla and oak aromas and flavors. Today, it's time to take a look at the reserve bottling. Darker in the glass, this one is a medium gold, but the aromas show plenty of oak influence -- though in a slightly different way. Here, the oak comes through as a butterscotch and caramel character with toast, spice-roasted apples and a faint doughy, yeasty note. The palate is medium-full bodied and much like the regular bottling, the texture is terrific -- from start to finish. It's balanced with acidity, but again, the oak is overwhelming the fruit. There's a little apple-lemon here and some of the yeasty and spice flavors are nice, but not enough to counteract the oak. It's hard to say if it truly lacks fruit or if the fruit was just bludgeoned into submission here. Again, if you like this style, this wine has some redeeming value, but at $40, I expect much more. Tomorrow, we'll start talking about the recent releases from Bedell/Corey Creek that did impress. Wine Spectator Likes Finger Lakes Riesling -- But is There a Glass Ceiling? If the Napa Valley is cabernet sauvignon country and Long Island is the land of merlot (and cabernet franc), the Finger Lakes region is definitely the U.S. region where riesling shines brightest. The deep, narrow lakes that give the region its name gather and hold a significant amount of heat in the warm summer season, extending the grape-growing season just long enough to ripen grapes as well as protect vineyards against potentially catastrophic early frosts. 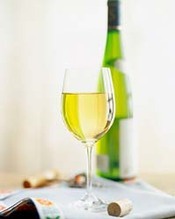 Recently, James Molesworth, on WineSpectator.com rated several Finger Lakes Rieslings well — in the high 80s — with Anthony Road Winery’s 2006 Semi-Dry Riesling receiving the highest rasting, an 89. Several wines were awarded 88-point scores, including Atwater Estate Vineyards 2006 Riesling, Chateau Lafayette Reneau 2006 Johannisberg Riesling, Fox Run Vineyard’s 2006 Riesling Reserve, Red Newt Cellars 2006 Reserve Riesling, Anthony Road Winery’s 2006 Dry Riesling and Atwater Estate Vineyards 2006 Dry Riesling. Several wines also received scores between 85 and 87. I've tasted most of these wines, and they certainly deserve high scores in my book. It’s interesting to me, however, that with so many wines so close to that magical 90-point score that none of them pushed through that barrier. Interesting probably isn't a strong enough word for how I feel about it. Suspect and ridiculous seem more appropriate. I'm not sure if Mr. Molesworth did these scores himself or how he conducted the tasting, but I know how Wine Spectator has conducted "blind" tasting session in the past. You see, blind belongs in quotes because they aren't truly blind. Members of the tasting panel don't know the individual producers before them, but they do know the vintage and grape(s) they’re tasting as well the region the wines come from. Is it possible that a preconceived notion about a region come into play? I think it's more than possible. It's likely. The last time Wine Spectator did an extensive piece on Long Island wines, there weren't any wines scoring 90 or above either. I can't help but wonder what would happen if you put some of that 89-point Anthony Road riesling into a bottle featuring a German label. Or, if you put one of Long Island's best merlots in a Bordeaux-labeled bottle. Maybe the scores wouldn't be any different, but I'm not convinced that many (if any) people can tell the difference between an 89 and a 90 anyway. It really makes me wonder why Spectator does their tastings this way. Why not do truly blind tastings? Is it just we've-always-done-it-this-way stubbornness, or is it to protect their tasters from giving a high score to a wine from an 'unworthy' region? Editors note: Jason Feulner, LENNDEVOURS' Finger Lakes Correspondent wrote about this topic as well. Instead of publishing both, I've asked him to either comment on this post, or write a follow-up post later this week. It's happening again: DEKS American Restaurant in Rocky Point is having another cask night. This time there will be an entire firkin (that's a little more than 10 gallons) of a special edition from the York Brewery in England. York Brewery has been experimenting with different varieties of hops and has been releasing ales that use only a single variety. The advantage of this for the person interested in developing their beer tasting skills is that single hop beers make it possible to focus on the flavor coming from only that one hop. The hop variety that we'll be studying on Friday is called Saaz. Saaz is a hop that originally comes from the region that is now the Czech Republic. This hop is responsible for the characteristic flavor of Bohemian Pilsners (most notably Pilsner Urquell). Saaz is often described as floral and/or grassy. Personally, I associate the aroma with crisp spiciness, so typically, when I brew with this hop, I'm looking for it to deliver an edge to the aroma and flavor that contrasts with the round, maltiness of the grain. Saaz is one of the four noble hops whose characteristic is a restrained (or delicate) bitterness and pronounced aroma. I've never tasted York Brewery's experiment with Saaz hops, but it will be interesting to see what they are able to bring out of this hop. Hope to see you there. The firkin will be tapped at 6 pm and pints will be served until the firkin runs dry. I have a lot of blogging to do to catch up on everything that we ate and drank last week. But first, we'll start with one of the recent Bedell Cellars/Corey Creek wines I tasted. We all know that the 'reserve' designation doesn't have any official meaning, but most of the time, on Long Island anyway, it means barrel fermentation and aging. The 'regular' bottlings usually mean more steel fermentation and more use of neutral oak. 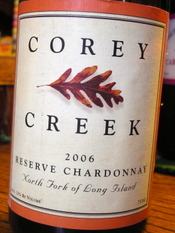 Tasted blindly, I thought that Corey Creek Vineyards' 2006 Chardonnay ($25) was Corey Creek's 'reserve'-style wine (which I'll be writing about later this week). And the price hints at that too I guess. There is a lot more oak here than I'd expect and than I'd prefer. Pale yellow-gold in the glass, the nose is dominated by vanilla, oak, sweet corn with butter and lemon. The medium-bodied palate offers great texture and acid balance from start to finish, but there is just too much oaky-vanilla character here for me. It overwhelms the apple and lemon flavors on the fore and mid-palate. The lingering, faintly minerally crisp finish is nice though. If you like barrel fermented chard, this is a pretty well made one, but I think there is just too much oak here for a somewhat cooler 2006 year. 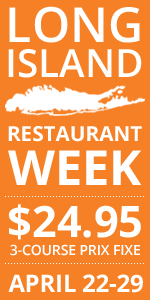 It's not a particularly good value either, within the Long Island market and beyond. While I was enjoying my trip to Pittsburgh last week, the finalists for the 2008 American Wine Blog Awards were named over at Fermentation. Some of my favorite blogs are among the potential winners, so congratulations to them. If you're to scurry over to Tom's blog to vote for LENNDEVOURS in the "single-subject blog" category, I'm sorry to say that I didn't make the group of finalists in that category this year. It's hard to know why, but it is what it is. It's easy to argue with how any set of awards is run -- no one is perfect, so let's not turn this into a big deal. I write this blog for myself and for you, my readers. There will bed other awards in other years. Who knows, maybe LENNDEVOURS just wasn't as good covering New York wines this year. It was a busy year for us at LENNDEVOURS headquarters. Head on over and vote today. Just in case you live under a rock and missed it, Gary Vaynerchuk, the man behind Wine Library TV will be hosting the next edition of Wine Blogging Wednesday. His theme, not surprisingly, is French Cabernet Franc. Gary loves these wines and so do I, so it's a theme I'm looking forward to. Of course, those who love over-extracted fruit bombs instead of nuanced, earthy-veggie-herbal reds, may not enjoy it as much. But hopefully they'll try something outside of their comfort zone. Join Gary Vaynerchuk on April 2 for WBW #44. Diploma Dispatches: USA...But Where is New York? So my plan was to use this week’s class—North America, minus California—as a jumping off point to talk about my visit to the North Fork over the weekend. Because surely we were going to taste a NY wine in class, right? Right? The most baffling wine of all was a Chardonnay from, of all places, Connecticut. It was not good. Disjointed, with oak that was out of proportion to the rest of the wine, it was one bizarre bottle. Still, I have to give it to the producers. It takes some kind of intestinal fortitude to make wine in Connecticut. And…that was it. No New York wine. The instructor said she didn’t have time to find a something in time for our class. I sympathize, to a degree — finding a NY wine at a NYC wine store can be regrettably difficult — but seriously. Even if I weren’t so rah-rah about the New York wine industry, I’d still think diploma students should be required to taste at least one wine from their closest wine-producing region. The fine folks at the WSET, the UK-based organization that administers the exam, must agree with me, considering that British wine is on our syllabus, for God’s sake. Looking on the bright side, our instructor was very upbeat about the New York wine industry, Long Island in particular, but it would have been much better to have something in the glass to give credence to her optimism. So, long story short, I have no way to seamlessly segue into my weekend on the North Fork. Not sure what I can’t say that Lenn hasn’t already covered, although I did get a sneak peek at some of The Old Field’s 2005 Pinot Noir, which I’m pretty sure Mr. Thompson has not tasted. I liked the bright, clear fruit and look forward to picking up a bottle when it becomes available. We took a tour of Shinn and got to check out the five acres of vines they recently planted, including some Pinot Blanc, a new variety for them. At Lenn’s insistence (and he was right to insist), I bought a bottle of Roanoke Vineyards’ 2004 Merlot, which I’m going to open for my some of my classmates—I just refuse to accept that we will not taste New York wines. Then, I'm hoping we can make it over to Great Lakes Brewing Company for a beer and maybe to pick up some of their more interesting stuff to take home to Long Island with us. Finally, before we get in the car and head back to Pittsburgh, we're going to Lola for dinner. The beef cheek pierogie is definitely calling my name. 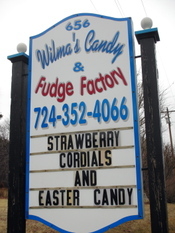 As for what we've been doing in Pittsburgh, we stopped at Nena's favorite local chocolate purveyor, Wilma's Candy & Fudge Factory. This has been a must-stop for my chocolate crazed grandfather for years and he hooked Nena early on in our relationship. And this week, Jackson got his first little taste. Me, I tried their dark chocolate (my preference) and it was pretty good too, if maybe a bit too sweet for my liking. Nena's favorite: peanut butter meltaways. We also drove up through the fog and rain to my dad's hometown of Youngsville, PA to see my grandmother. After we stopped in to see her, we were going to head to Jamestown, NY for hot dogs at Johnny's Lunch, but Jackson's need for lunch trumped our own, so we stayed local, visiting Richard's, a local joint where my grandfather had breakfast every morning forever. I didn't have high expectations, but the place had been renovated recently and they were even serving local bison from Lazy J Bison Farm in nearby Sugar Grove. The burgers Nena and I got were great. We also had dinner at Willow with friends a couple nights ago, but I'll probably write more about that in a separate post. After our trip to Ohio today, we're taking Jackson to the Pittsburgh Zoo tomorrow, celebrating Easter a day early with my family on Saturday and then heading back to Long Island Sunday. Well, the trip to Pittsburgh, with Jackson, went far better than I expected it to. True, he only napped for 45 minutes of the 7 1/2 hour trip rather than the 3 hours or so he would have had we not been on the road, but we made good time and Jackson has been the talk of the town since we arrived. Okay, maybe just within my extended family, but he's the star none the less. Yesterday, Nena, Jackson and I, along with my sister, parents and grandparents, went to Log Cabin Inn in Harmony, PA, just north of my parents' house in Cranberry Township. This isn't a fine dining establishment by any means but it's a bit of a family tradition when we're in town and it's extremely kid friendly. And, Nena always shares a slice of their famous peanut butter pie with my mom and sister. One thing about my family, if you tell them you really like a certain food item, you can bet they'll put it on front of you again and again. That pie is a prime example. The fried zucchini is good and the salad I had came with the typical-for-Pittsburgh French fries on top. Yes, fries are a condiment in the 'burgh. You'll find them on salads and on sandwiches here. Jackson really like the macaroni and cheese and the apple sauce. And, being as it was St. Patrick's Day, I had to have a Guinness, which was served just a little too cold, but not horribly so. Tonight we're going to dinner at Willow with our friends Jon and Erin. Look for a report in the next couple of days. We'll be in western PA for most of the week, but fear not -- blogging silence won't be necessary. In fact, there will be plenty of New York wine coming with us and we also have some blog-worthy meals planned already. Nena and I are cooking for the family Monday night at home. Then Tuesday, we're meeting up with one of my fraternity brothers and his wife for dinner at Willow. Wednesday we're heading to the northern part of the state to see my grandma and maybe over to Johnny's Lunch, a childhood favorite and home of the Johnny's Hot (dog). I used to eat them by the dozen. No, I'm not joking. I used to have that kind of metabolism. Then Thursday, Nena and I are leaving the little guy with his grandparents so we can drive to Cleveland to have dinner at Michael Symon's Lola. It's going to be a busy week, but a fun one I'm sure. The long car trip with the little guy is the only stressful part, but we've loaded up on healthy snacks for him so we should be fine. 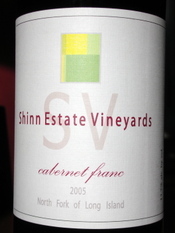 I like several of the others, but my favorite of Shinn Estate Vineyards' current red releases is their 2005 Cabernet Franc ($39). Extremely aromatic, the nose is a mélange of raspberry, cherry, earth, herbs and Moroccan spice market aromas. Gentle tannins provide just the right structure for a wine that deftly balances fruit flavor with nice earthiness and spice. Raspberries, sage, grilled mushrooms and savory spice mingle on the palate showing both intensity and nuance. This is the sort of wine, despite the price, that proves cabernet franc just might be Long Island's best red variety. Simply delicious, and with only 175 cases made, there isn't much of it. Drink now and for up to five years. Many of the 2005 merlots that I've tasted have been big, plush and -- frankly -- not very true to Long Island's unique terroir. These reds lean more towards California in style, at least in their youth, and aren't very good values. 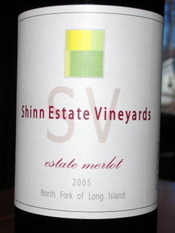 Lovers of true Long Island wines should thank Shinn Estate Vineyards for staying true to the region with their Shinn Estate Vineyards 2005 Estate Merlot ($27). It's a ripe, but surprisingly understated and agile red with blackberry, raspberry and plum on an expressive nose that is filled out with herbs, mocha, earth and vanilla. Similar flavors come through on the palate, with the addition of a minerally note on a medium-long finish. Medium-grip, but well-incorporated tannins provide nice structure and will give this wine some longevity, maybe 5-7 years. Today, it benefits greatly from an hour or two open, breathing. I had high hopes when I opened this wine from King Ferry Winery/Treleaven . I've thoroughly enjoyed their rieslings in the past and thought that their rose (made with cab franc) was pretty nice too. Unfortunately, this one wasn't my favorite. Treleaven's 2006 Gewurztraminer ($14.50) is an extremely pale straw yellow. The nose is tight and doesn't offer much in the way of aromas -- some light floral notes and just a little spice. Medium-light bodied, it is somewhat neutral tasting with just a little bit of the classic Gewürztraminer character that I love (rose petals, lychee, ginger spice). The finish is short and there is just enough acidity to keep it from feeling flabby on the palate. Again, it's not flabby or flawed, but there just isn't much here. It's delicately flavored to the extreme. I taste a lot of New York wine. I mean a LOT of New York wine. In the past, I've only posted a small sampling of these wines, mostly because I don't like to write one-paragraph reviews that only offer the smells and flavors of the wine. I like to provide a little history, a little context. 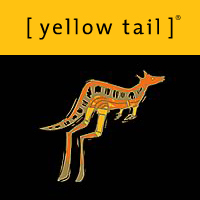 Where does the wine fit into similar wines in the region? How are the growing conditions of the vintage displayed in the wine? What foods did or would I enjoy with it? These types of reviews take a lot more time to write than I seem to have lately -- at least if we're talking about doing them for every single wine that crosses my lips. On the other hand, I'd really like to be able to tell you about more of the wines I'm tasting. I get a lot of emails "Saw your review on Winery A's merlot, have you tried their cab franc?" In most cases, yes I have...but I just haven't published reviews. I can also be somewhat arbitrary when I pick wines to publish reviews for. So, I'm going to start publishing more reviews here, even if they are a bit scaled down and largely comprised of my tasting notes. I think it's important to give a fuller picture of the state's wines. I'm absolutely not looking to become the Robert Parker of New York wine however, so I'll never resort to the "smells, flavors, score" mentality.